Suburban Press is a quality conscious, award winning, commercial printer with its roots deep in the Cleveland, Ohio landscape. We offer a wide variety of products and services to help produce quality printing at an affordable price. Please feel free to contact us to help in your next project. Suburban Press is a company that will meet your needs right from the start. The process begins in pre-press and we strive to keep up with the ever-changing wave of technological growth. We offer both Mac and PC solutions, with digital layout, digital proofing and platemaking. Suburban Press will meet your digital needs in order to handle the job correctly. Suburban Press is a full sheet-fed printing operation. We provide one color through six color presses ranging in size from 14 x 20 to 28 x 40. We feature Heidelberg and Miller presses, offering perfecting capabilities on all of our presses with aqueous coating capability. Whatever your specific printing needs are, Suburban Press will meet them. 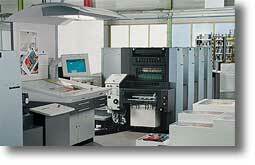 In addition to these options we offer any other bindery application that your job might require. Suburban Press will meet all your bindery, finishing and mailing needs. Suburban Press has warehousing and shipping services to handle all of your materials. Our warehousing allows you, the customer, not to worry about storage and fulfillment. We can ship worldwide with various shipping companies to deliver you the lowest price. Suburban Press has full fleet of delivery vehicles ranging from in-town vans to large dock high trucks to move large orders wherever they are needed. We also contract with various over-the-road trucking firms to move large amounts of product fast and safe. Please contact us to arrange a pickup of your next project.